What are the goals of NCMDR? What is the important of NCMDR? Who should make a recall? How can an establishment make a recall? Is it safe to report (Confidentiality)? What is the in vitro diagnostic device (IVDD)? What is medical devices accessories? 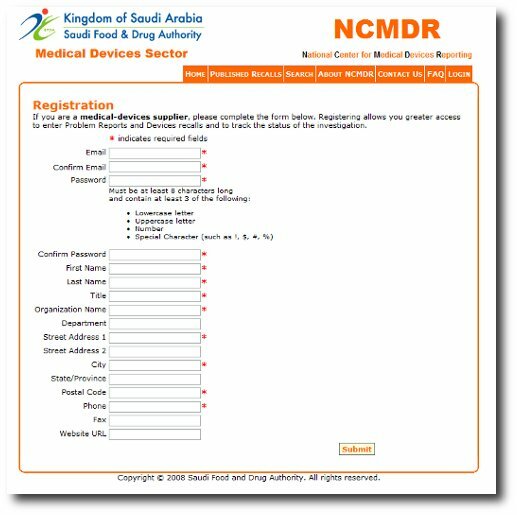 National Center for Medical Device Reporting (NCMDR) is an organization managing a database of information on safety and performance related aspects of medical devices and capable of taking appropriate action on any confirmed problems. Improve protection of the health and safety of patients, users and others. Disseminate relevant device related information which may reduce the likelihood of, or prevent repetition of adverse events, or alleviate consequences of such repetition. Execute a key aspect of the SFDA's post-market activities. Encourage collaboration between manufacturers and health care facilities to identify and investigate adverse events associated with medical devices and take appropriate action. 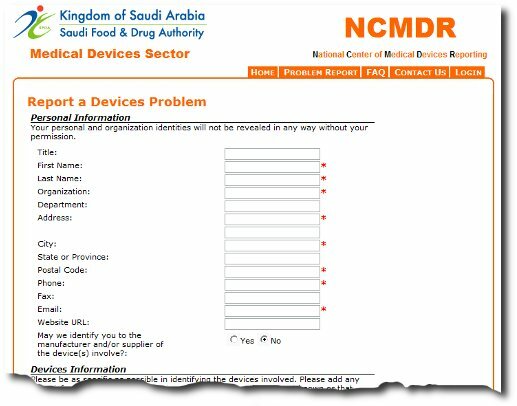 Encourage the reporting of adverse events by medical device institutions and users, manufacturers, authorized representatives and organizations involved in supplying medical devices to the KSA. Provide a database of information on the safety and performance of medical devices that is suitable for the exchange of adverse events information with other Regulatory Authorities. Significant medical devices failures occur and are likely to recur and harm people or the surroundings. A malfunction or deterioration in the characteristics or performance. A malfunction or deterioration should be understood as a failure of a device to perform in accordance with its intended purpose when used in accordance with the manufacturer's instructions. The intended purpose means the use for which the device is intended according to the data supplied by the manufacturer on the labeling, in the instructions and/or in promotional materials. An inadequate design or manufacture. This would include cases where the design or manufacturing of a device is found deficient. An inaccuracy in the labeling, instructions for use and/or promotional materials. Inaccuracies include omissions and deficiencies. Omissions do not include the absence of information that should generally be known by the intended users. A significant public health concern. This can include an event that is of significant and unexpected nature such that it becomes alarming as a potential public health hazard, e.g. human immunodeficiency virus (HIV) or Creutzfeldt-Jacob Disease (CJD). 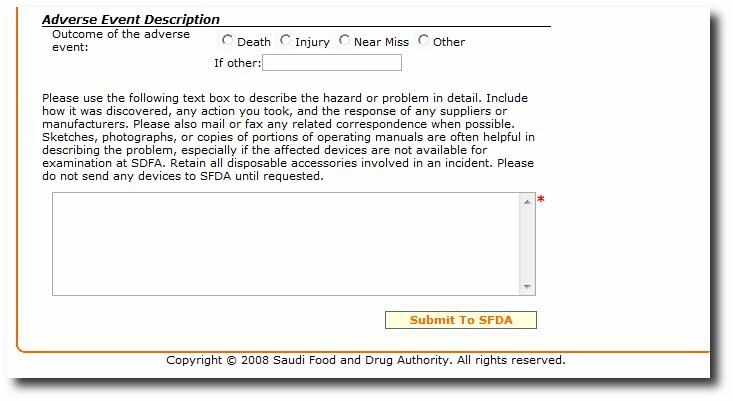 Use error related to medical devices, which did result in death or serious injury or serious public health concern, should be reported to the SFDA. Note a change in trend (usually an increase in frequency), or a change in pattern of an issue that can potentially lead to death or serious injury or public health concern.). Initiates corrective action to prevent death or serious injury or serious public health concern. Death of a Patient, User or Other Person. Serious Injury of a Patient, User or Other Person. Life threatening illness or injury. Permanent impairment of a body function or permanent damage to a body structure. A condition necessitating medical or surgical intervention to prevent permanent impairment of a body function or permanent damage to a body structure. The interpretation of the term "serious" is not easy, and should be made in consultation with a medical practitioner when appropriate. The term "permanent" means irreversible impairment or damage to a body structure or function, excluding minor impairment or damage. Medical intervention is not in itself a serious injury. It is the reason that motivated the medical intervention that should be used to assess the report ability of an event. No Death or Serious Injury Occurred but the Event Might Lead to Death or Serious Injury of a Patient, User or Other Person if the Adverse Event Recurs. All events do not lead to a death or serious injury. The non-occurrence of such a result might have been due to circumstances or to the timely intervention of health care personnel. The event is considered "adverse" if in the case of reoccurrence, it could lead to death or serious injury. This applies also if the examination of the device or a deficiency in the information supplied with the device, or any information associated with the device, indicates some factor which could lead to an event involving death or serious injury. Include relevant information that might impact the understanding or evaluation of the adverse event AND that is not included elsewhere in this report. This judgment may be difficult when there are multiple devices and drugs involved. In complex situations, it should be assumed that the device was associated with the event. A recall is an action taken to address a problem with a medical device that violates SFDA law. Recalls occur when a medical device is defective, when it could be a risk to health, or when it is both defective and a risk to health. A medical device recall doesn't always mean that you must stop using the product or return it to the company. A recall sometimes means that the medical device needs to be checked, adjusted, or fixed. Legally, SFDA can require a establishment to recall a device. This could happen if a establishment refuses to recall a device that is associated with significant health problems or death. Supplies information to help users identify the product and take steps to minimize health consequences. Takes action to prevent the problem from happening again. Device reporting can be entered by healthcare providers, manufacturers, authorized representative, distributors and public. To enter a new device report by either healthcare providers or manufacturers, authorized representative, distributors and public first you must click on the "Click here to Report" at home page to transfer you to new page. If you are healthcare provider go to the first paragraph to report medical device adverse event and also the Manufacturers, authorized representatives, importers and distributors are not required to log in prior to submitting Adverse Events Reports. However, logging in prior to entering a Report ensures that your identifying information is automatically entered. (e.g., e-mail address, name, organization). But if you logged in, manufacturers, authorized representatives and distributors can click on the Device report tab on the top menu bar. The device report entry page is divided into two sections. The first section contains your personal information which is pre-populated with information in your profile. You can make any changes you may wish. All fields marked with a red asterisks (*) are required. The type of devices that were involved in the event. The manufacture of the device. If other devices were involved in the incident, check Yes and enter the devices in the box below. If there were no other devices involved, check No. If there were other devices involved in the Adverse Event, enter the devices here. Is the device available for inspection? Check Yes if SFDA is able to inspect the device. Check No, if the device is unavailable for inspection. If the device is a single-use device, indicate if the device was reprocessed. Indicate if you are experiencing similar Adverse Event with other units of the same model. Please use the text box (Figure 2) to describe the hazard or adverse event in detail. Include how it was discovered, any action you took, and the response of any manufacturers , authorized representative and distributors. Please also mail or fax any related correspondence when possible. Sketches, photographs, or copies of portions of operating manuals are often helpful in describing the Adverse Event, especially if the affected device is not available for examination at SFDA. Retain all disposable accessories involved in an incident. Please do not send any devices to SFDA until requested. All fields marked with a red asterisks (*) are required. If the Adverse Event resulted in death, injury, or near miss, check the appropriate button. Otherwise, please click Other and briefly describe the outcome in the box immediately below. Please enter details of the Adverse Event. The more relevant details you provide, the quicker SFDA can assess the Adverse Event. After all three sections of the adverse event report have been completed, The item will enter into the system for investigation as well as an E-mail will be automatically sent to the reporter with the Confirmation Code and a link to access the adverse event report. The Confirmation Code allows users to access previously entered Adverse events report (Figure 3). When accessing previously entered Adverse events reports, additional information can be appended to the original description. These information do not alter information entered initially. NCMDR staff may modify the original text to conform with industry standard nomenclature. How can an establishment makes a recall? All medical-devices manufacturers , authorized representative, importer and distributors must first register (Figure 4) in order to enter Devices Recalls. After registering, the SFDA Administrator reviews the information and activates the account. Then, a manufacturer , authorized representative, importer and distributors is able to log into the account. SFDA will share all submitted information whether recalls or reports with ECRI and other global authorities, and SFDA will ensure to hide the identity of the person who submitted the information and will not share personal data with any other parties. All personal data will be used within SFDA only. providing information for medical or diagnostic purposes by means of in vitro examination of specimens derived from the human body; and which does not achieve its primary intended action in or on the human body by pharmacological, immunological or metabolic means, but which may be assisted in its intended function by such means. What is the in vitro diagnostic device(IVDD)? In-vitro medical device: means a medical device, whether used alone or in combination, intended by the manufacturer for the in-vitro examination of specimens derived from the human body solely or principally to provide information for diagnostic, monitoring or compatibility purposes. This includes reagents, calibrators, control materials, specimen receptacles, software and related instruments or apparatus or other articles. Accessory: means a product intended specifically by its manufacturer to be used together with a medical device to enable that medical device to achieve its intended purpose.